In the early 1980s, a group of musicians and educators realized that advanced development and vital components of professional music training were needed in Israel. Genres such as Jazz, Blues, Rock, R&B, Funk and Latin styles were significantly untapped and overlooked, despite the fact that their increasing presence intertwined with Israeli music culture was becoming more evident. Rimon wanted to change all that and build an institution that helped musicians exploring contemporary styles of performance and professional skills to develop their musical identities. In 1985, with a strong sense of passion and determination, they established Rimon School of Music in Ramat HaSharon; a northern suburb of Israel’s arts epicenter Tel Aviv. After opening the first studio, Rimon was quickly overwhelmed with applicants seeking an inspiring atmosphere, designed to enable optimal learning and performance experience. Today, Rimon cultivates the best musical talent from across Israel and attracts international students from around the globe. Rimon’s priority is to nurture musicianship, creativity, and collaboration. We strive to deliver high-quality music education with relentless dedication; an ethos that carries over to the work we do in the community at large. Rimon’s reputation stems from the school’s innovative approach to music, diversity, and technological advancement rooted in Israel’s dynamic and entrepreneurial culture. Rimon graduates build Israel’s contemporary popular music scene and have created some of Israel’s most beloved and celebrated music! Their work is embedded throughout Israeli life and culture. We invite you to be among the next generation of students to take this music forward throughout the world. Students from all over the world can apply to come to Rimon to study for one year in English. Courses include a complete curriculum of music theory, rhythmic and melodic ear training, arranging, music technology, songwriting, composition, improvisation, private instruction, and ensembles. Admission is based on audition and interview. Students who also speak Hebrew may elect to stay longer, and can join majors including composition and conducting, songwriting, contemporary music production, music education, performance, the Jazz Institute, or the Performance and Music Production combined major. As part of Berklee’s affordability initiative, students who have applied and been accepted to Berklee can elect to complete their first-level courses by studying in Rimon’s First Year in English program. Hebrew-speaking students can elect to stay at Rimon for two years and then may audition to transfer to Berklee to complete their degree. Israeli students have been completing their degrees at Berklee for many years as part of our longstanding academic agreement. Now, English speakers who are admitted to Berklee have the chance to benefit from studying their first year here in Israel. Students may also opt to continue their studies at Newpark Music Centre at Dublin City University in Ireland; also a Rimon partner. Credit transfer requires successful course completion with grades of B or better. · Studying contemporary American, Latin, and African-diaspora styles while being surrounded by Israeli life and the rich cultural tapestry of the Middle East and Mediterranean regions. Please note: Rimon is a commuter campus and we do not offer a housing program, but our enrollment coordinator helps guide admitted students to find local apartment shared rental options. Rimon supports our students who participate in community betterment programs by offering small stipend scholarship awards. Rimon’s distinguished faculty is comprised of educators and active professional musicians well-recognized throughout Israel and beyond. Rimon School is highly respected for its academic excellence and wide range of opportunities for artistic expression. Rimon challenges students with a rigorous, enriching, career-minded curriculum while developing personal growth and interactive skill. English-speaking students can study with us for one full year. Hebrew-speaking students can elect to earn a three-year diploma, or a degree in partnership with Open University. Some students split their studies between Rimon and the world-renowned music and arts college Berklee in Boston, Massachusetts through our longstanding credit transfer agreement, or continue to Berklee for a master’s degree in Boston or Valencia, Spain. Some students complete their studies at other premier institutions with whom we have academic relationships. 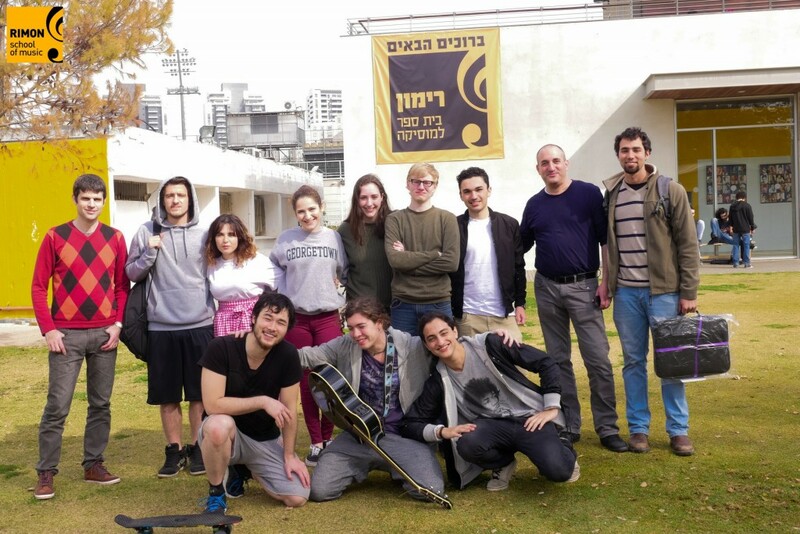 Students enjoy collaboration in a wide array of student-led projects and performances, including festivals and events in Israel and abroad. Students participate in school-driven productions which present them with realistic professional scenarios, which sharpen valuable skills and further position them for career success in the contemporary music arena. These productions include, among many others, The ShiRimon Singers Interpretation Competition, The RockRimon rock groups showcase, and jazz performance and composition competitions. In addition, we offers students advancement on their principal instrument through private lesson, instrumental labs, and a variety of ensembles designed to elicit musical and professional growth. 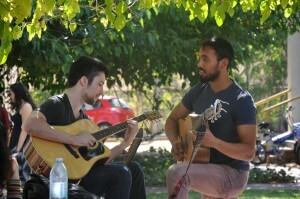 Rimon’s campus inspires social interaction and impromptu musical collaboration. Our classrooms encircle a welcoming center lawn and courtyard where students build lasting connections. The Rimon Experience is designed to enhance your music studies while deepening your connection with Israel! The Rimon Experience will help you acquire a global perspective and gain a taste of independent living through many special activities. We Welcome You and Invite You to Connect! Campus: Shmuel Hanagid 46 in Ramat HaSharon (we recommend you make an appointment for a campus visit). The official application period for 2019/20 opens December 2nd, 2018 but we invite you to contact us anytime!